Tasibeh Girls School is a school for girls in Pindi, a village outside Sialkot in rural Pakistan. 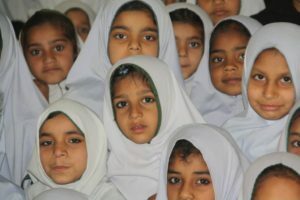 The school opened in 2008 and aims to provide basic and free education for girls from poor families who would not otherwise have access to education. There is a government school in the area but places are limited. The school is supported and sustained by funds raised in the UK by the charity Tasibeh Girls School Fund. The charity is based in Rotherham and has support from across the South Yorkshire community. The majority of the funding comes from private individual donations and fundraising events across Rotherham community. It costs about £14,000 a year to run the school. The school currently has 180 girls on roll and now educates at both primary and secondary level. The educational focus is in both English and Urdu and a curriculum model based on UK teaching learning methods. The energy and drive behind the development and continuing success of the Tasibeh Girls School comes from Tassibee – Its staff team led by Khalida Luqman, the amazing Tassibee women, the Tassibee Management Committee and all the friends and supporters which Tassibee has made in Rotherham.